The familiar Start menu is back, with some improvements, including a space you can personalize with your favorite apps, programs, people, and websites. Microsoft's Windows 10 is still in testing, but hardware makers can't wait for the day the OS replaces the controversial Windows 8. "When we see a healthy macroeconomic environment and an aging installed base we expect a new [OS] deployment. The [PCs] are fantastic and at new price points. That's kind of a perfect storm, combined with a new OS, and the OS usually pushes the upgrade cycle," James said. James is "very enthusiastic and optimistic" about what Microsoft is doing with Windows 10. "They're being extraordinarily responsive to customers," James said. 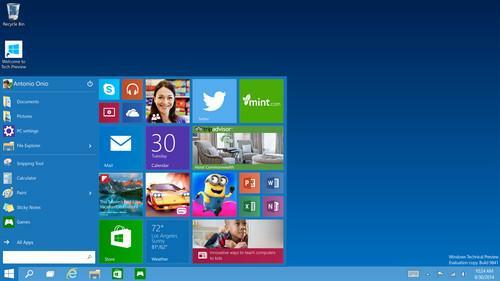 All major PC makers are expected to support Windows 10 when it is released early next year. Hardware makers are already customizing drivers and products for Windows 10. Advanced Micro Devices' new PC chip, code-named Carrizo, will take advantage of new features in Windows 10. The chip maker is expected to detail those features early next year. "The ability to create applications that are super-scalable from phone to tablet to PC is the big step in a lot of ways," Hand said. "We're genuinely excited about it," said John Groden, director of product development for Elitebook laptops at HP. For hardware makers, Windows 10 is a relief as it opens a pathway for upgrading hardware from Windows 7, said Bob O'Donnell, principal analyst at Technalysis Research. A lot about Windows 10 is still unknown, especially on the tablet side, O'Donnell said, adding that details relating to version breakdown, devices and pricing of Windows 10 remain unclear. It's too early to predict the impact of Windows 10 on PC shipments, but it won't be as big as the kind of boost Windows 7 provided to PC shipments in 2009, said Jay Chou, senior research analyst at IDC. "Vista did not have to compete with smartphones and tablets," Chou said. Windows 10 "is more amenable to power users, which is important for commercial upgrades," Chou said. As Technalysis Research's O'Donnell put it, "Windows 10 finally gets past Windows Vista version 2, which was what Windows 8 was."